Rebounding is a great form of exercise that can bring many health benefits for the user. However, you shouldn’t just pick the first rebounder or mini-trampoline you come across. A quality rebounder is necessary to make the most out of the exercise routine, and taking the time to find a good unit will serve you well and keep you safe while working out. To make your shopping process easier, we’ve compiled your buyer’s guide of what to look for when purchasing a rebounder. A quality rebounder will have quality parts in every place. One of the first parts to look at is the springs. You want to be wary of any mini-trampoline that makes use of tube springs. The technology is older and doesn’t provide as much movement, ultimately limiting the potential of your exercise routine. Another type of “spring” to look out for is in rebounders that use bungee cords. Depending on the intensity of your exercises, bungee cords may not provide proper support, leading to incorrect landings and potential ankle issues. The bounce response time is also sluggish, and bungee cords will wear down over time, requiring replacement. Instead, you should look for a rebounder with tapered steel springs. These parts support different body weight ranges and movements, giving the unit much more flexibility in use and longer durability. 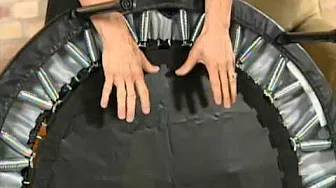 While you’re keeping an eye on springs, also look for a spring cover to keep you and any others safe if something manages to pop off during your routine. The quality of the mat is just as important to your safety and efficiency as the springs are. Pay close attention to the mat material; canvas, nylon, and plastic mats are likely to stretch over time, leading to support issues and potential pronation of the feet. Make sure your mat material will resist stretching. High quality materials are also capable of resisting weather damage should you leave your rebounder outside. You should also look for a mat that will provide enough support while exercising barefoot, so you can make full use of different workout routines. The base of the rebounder holds the whole unit together and provides framework support, and poor quality increases the risk of the mini-trampoline breaking and causing accidents. All steel units provide much better support than those that integrate plastic into the design. Even so, not all steel units are equal. Look at how you’re going to assemble your rebounder. Some units come with screw-in legs, which you’re better off avoiding. Screw-in legs have the potential to wear down over time, come loose while in storage, and provide less stable support overall. Snap-in legs are a much better option. Even when you check for high quality parts, there’s still a chance that something may cause a part to break. For this reason, it’s important to pick out a rebounder with replaceable parts. You don’t want to have something go wrong and have to purchase a whole new product as a result. Rebounders and mini-trampolines come in various sizes. In general, rebounders tend to have narrower width and rest closer to the ground than mini-trampolines. Even so, both are forms of relatively small exercise equipment, making them easy to store and transport. If traveling with your rebounder is in your future, you may want to consider a rebounder that is easy to carry. Some rebounders are foldable and come with carrying cases, allowing for simple storage and transport. Rebounding relies on jumping and the force of gravity to give you the proper benefits. Depending on your weight, you might get more efficient results out of one rebounder as opposed to another. Springs should provide enough tension to get the most out of your bounce, while all parts should fully support your weight for safety purposes. Considering your own weight is yet another reason to find a high-quality mat that won’t stretch over time.